Pastel-Izers There is 1 product. Let your imagination run wild with the Manic Panic Manic Mixer Classic Cream Formula Pastel-izer, the pastel possibilities are simply endless! If you’ve found the hair color of your dreams but wish it could be a little bit lighter, you should definitely consider picking up some hair dye pastelizer. This incredible product gives you the opportunity to transform any hair dye you like to lighter shade. Transform your Bubblegum Blue into a sky blue, or Raven into a muted black. It’s never been easier to get the pastel look you want, thanks to the Manic Panic pastelizer. So grab some now along with your favourite hair dye color and get a look that’s completely unique to you. Though we stock a wide range of hair dye colors, the number, unfortunately, isn’t endless. And that’s why we love the Manic Panic Pastel-izer; it pretty much makes the number of hair colors available to you endless! There’s no better way to dilute a hair dye color and put your own unique stamp on it. By mixing a tub of pastelizer with some of your chosen hair dye you can make it as pale and light as you want. If you’re crazy about our selection of pastel hair colors, then the pastelizer simply unlocks a whole new range of awesome colors for you. For example, you could make Manic Panic pastelizer purple haze for a more subtle hint of purple. The more pastelizer you use, the lighter the color. There may just be some colors that you think are slightly too bright to suit your look, and the pastelizers will help you tone things down just a little bit. If you want your Shocking Blue to be a little bit less shocking or your Pillarbox Red to be slightly less bold, then you should definitely look into getting some pastelizer. Turn your Hot Hot Pink into a Manic Panic pastelizer cotton candy pink color to join the pastel craze! It’s also worth noting that in the battle of Manic Panic pastelizer vs conditioner, we think the pastelizer is the better choice. Not only is it made by hair dye professionals but the mixer is also certain to provide a longer lasting and fuller color. If you’re serious about making sure your new hair color looks as good as it can, then you should definitely use the pastelizer alongside a color preserving conditioner. 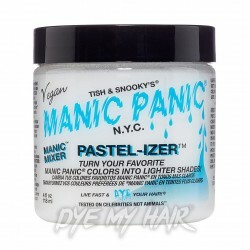 The Manic Panic pastelizer ingredients will help condition your hair while you are dyeing it. The benefit of having pastel Manic Panic with conditioner is that it will keep your hair healthy and strong. Dye-hards will know bleaching and dyeing your hair can cause it to become dry and brittle. This formula will keep those annoying split ends at bay and will also strengthen your hair. It’s also completely vegan friendly and produced in a cruelty free environment. What more could you ask for? Now that you’ve got your tub of pastelizer in one hand and your favourite hair dye color in the other, you’re probably wondering ‘What next?’ Luckily the process is easy and straightforward! Pour a generous amount of the pastelizer into a bowl and mix with your hair dye of choice. We recommend only mixing products of the same brand and reading the instructions to check the suitability for mixing. How much hair dye you mix in depends on how dark you want your hair color to be. Make sure you’re certain about the shade you want. It is usually best to perform a patch test. This will also help determine if you are allergic to any products before you go in for full coverage. Next, just use it like you would any other hair dye, make sure you remember to bleach your hair before using the pastelizer, otherwise the color might not come through quite as you wanted it to. Though you can use the Manic Panic pastelizer on brown hair or blonde hair, bleaching first will provide you with a blank canvas to work on. After you have finished dyeing your hair it is all about preserving your new color for as long as possible. Avoiding applying heat with products such as hair dryers and straighteners will help lock that color in. Color preserving hair care products are also definitely worth using. Using Manic Panic’s pastelizer really is as simple as that and that’s what makes it such an essential product for anyone craving an alternative look. It adds a fun DIY element to dyeing your hair, ensuring that the color of your head is exactly what you want it to be. No need to compromise on color anymore – you can finally achieve hair color perfection! Don’t believe us? Be sure to check out a Manic Panic creamtone review for extra reassurance. What more could you ask for? If you’re ready to go after the alternative look you’ve always wanted, ditching that brown or blonde head of hair you’ve always had, be sure to take a look at our super extensive range and consider boosting your look with hair dye pastelizer.